38' Bayliner motor vessel | Christian & Co. The vessel was inspected while hauled. Hull construction material is molded fiberglass. Deck is constructed of molded fiberglass and above deck structures are constructed of molded fiberglass. Coring is unknown. Bulkheads are constructed of plywood. Overall condition of the hull structure appears satisfactory. The vessel’s weight is unknown. Exterior rails and hardware appear satisfactory. Cosmetic condition of vessel appears satisfactory – marginal externally and satisfactory – marginal internally. Vessel’s external colors are white with blue and green boot stripes and blue accent stripe. Below waterline through hull fittings appear satisfactory. The vessel is equipped with one Rule 1500 (aft) electric/automatic bilge pump and one Rule electric/automatic bilge pump below the step into the cabin and the bilge pumps appear satisfactory – marginal. The bilge is holding minimal water. The ventilation system consists of two blowers and natural ventilation and appears satisfactory. General housekeeping appears satisfactory. The condition of the coring, in the stringers, deck, and elsewhere as applicable, is beyond the scope of this inspection. Engines’ external surfaces appear satisfactory and exhibit moderate corrosion. Engine hour meters were not seen. Motor mounts appear satisfactory with surface corrosion. Cooling systems appear satisfactory. Fuel system and components appear satisfactory. Exhaust system and components appear satisfactory. Electrical system and components appear satisfactory. Engine control systems appear satisfactory and shaft logs appear satisfactory. Steering control systems appear satisfactory and rudder ports appear satisfactory. Propulsion components appear satisfactory (work is in progress). Waste system and components appear satisfactory. General service seawater systems appear satisfactory. There is an unknown capacity in one fuel tank (in use) located to port forward of engine room. The starboard tank has a hole in it and it is not in use. Fuel tank surfaces, where visible, appear satisfactory – faulty and the securing mechanism appears satisfactory. The fuel fill, vent and feed lines and components appear satisfactory. The AC shore inlets and connections appear satisfactory. The AC wiring and outlets appear satisfactory. The AC main feed are protected with circuit breakers. Battery arrangement appears satisfactory. Batteries are equipped with disconnect switches. DC wiring appears satisfactory. Circuit protection for the AC and DC branch system appears satisfactory. Wire terminations and connections appear satisfactory. Wire organization and arrangement appears satisfactory. Vessel has three portable fire extinguishers two manufactured in 2007, one in 1987. Vessel has no fixed fire suppression system. The safety components includes: approximately eight to ten various type PFDs and three throwable PFDs; distress flares with expired (2001) certification; small first aid kit; one anchor with chain and line rode that appears satisfactory. Navigational and anchor lights appear satisfactory (no all around light seen). Other safety equipment includes a handheld spotlight, electric horn, first aid kit. The vessel is a production fiberglass express cruiser equipped with two gasoline inboard engines. The client purchased the vessel in 2006. He stated that he has added a bait tank on the swim platform and the head intake currently has a bung installed. The head uses fresh water. The client intends to have the hull bottom painted and the starboard propeller shaft seal serviced while the vessel is hauled. The vessel has a hole in the starboard fuel tank and the fuel tank has been abandoned, there is deterioration of the bulkhead in this area. The inboard edge of the aft berth’s mattress is wet on the bottom; this is in the area of the bulkhead and tank damage. The vessel is basically sound, but it exhibits significant deficiencies. Upon completion of the recommendations the vessel should be suitable for its intended purpose as a near coastal cruising and protected waters vessel. 1. Patch the hole in the transom for the transducer cable bracket, the fastener is missing. We strongly encourage removing unused fasteners in the transom and properly patching all holes. Alternatively, reuse the holes or fasteners if they provide a benefit. 2. Mount the aft bilge pump in its designed support screen. 3. There is “build up” on the engine cooling water intake through hulls. The through hulls are located in the aft engine room bilge and the bilge in this area is holding water. 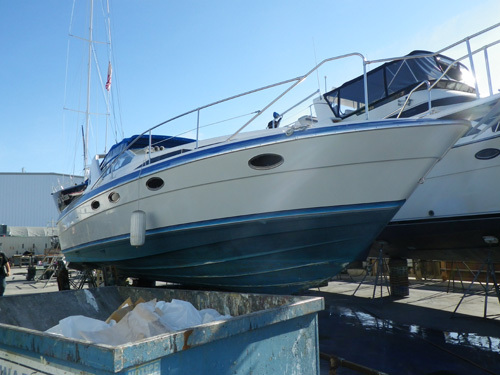 Remove the water, clean and inspect the through hulls and valves, service as necessary. Replace rusty hose clamps on the engine cooling water intake hose connections and elsewhere if/as necessary. 4. There are weep stains and corrosion visible on a fitting on the bottom, outboard of the starboard engine’s heat exchanger. Address appropriately to eliminate any weeps or leaks and clean stains and corrosion to allow detection of any future weeps or leaks. 5. Wing nuts are in use on batteries and the wing nuts on the battery between the engines are loose. Replace wing nuts with steel nuts and lock washers on all battery terminals (per A.B.Y.C. recommendations). 6. The center aft cockpit drain was previously connected to a hose and a transom through hull. The drain is now open and a smaller hose is inserted into the original drain hose. Determine the significance of this modification, return the center cockpit drain hose and address the smaller hose discharge appropriately. 7. Repair the deteriorated bulkhead forward in the engine room. 8. The starboard fuel tank has a hole corroded through the aft edge, the tank is currently abandoned. Assure that the fuel distribution system to both engines is in compliance with A.B.Y.C. recommendations, including suitable fittings, proper hose connections and proper securing of all components. Consider replacing the corroded fuel tank. Carefully monitor the port fuel tank for any corrosion and address if/as necessary. 9. The athwartship reinforcement aft of both engines sound “soft”. Determine the significance of this sound and address appropriately. 10. The stringer about the starboard engine’s forward inboard motor mounts sounds “hollow” and there are wooden plugs in the stringer. There are no plugs in the port side. Determine the significance of the plugs and the hollow sounds and repair if/as necessary. 11. Service as a result of corrosion on the port engine’s outboard forward motor mount, eliminate any leak causing the corrosion. Clean corrosion to allow detection of any future leaks and repair any damage as a result of the leak. 12. Provide and install intake hoses on the engine room ventilation blowers, lead the intake hoses to the lowest portion of the bilge but secure them to prevent contact with the hull bottom. 13. Service and prove the horn properly functional or provide a suitable sound signaling device per federal regulations. 14. Assure that there is a suitable and functional all around light for use underway in limited visibility or at anchor. 15. Service the compass, it is dry, or replace the compass. 16. There is a thumb print size piece of fiberglass missing out of the top forward end of the starboard propeller shaft tube, repair or replace this tube prior to reassembly of the shaft seal. 17. Determine the source of the moisture below the aft berth mattress on the inboard edge, eliminate the source, dry this area to prevent further deterioration or corrosion of components exposed to the moisture. 18. Properly secure the step into the cabin to prevent an accident which may result in personal injury. 19. Maintain the fire extinguishers per N.F.P.A. recommendations. 20. Provide federally required, approved and current distress signal flares. 21. If the vessel is to be anchored, provide a secondary anchor and rode for use in two anchor situations or emergencies. 1. There is some wear visible on the rubber in the motor mounts, consult with a mechanic regarding the need to service or replace motor mounts or rubber components and address appropriately. 2. Modify the raw water pump connected to the through hull below the step into the cabin. Assure that the pump is properly secured, it felt somewhat loose. Replace the non-reinforced hose in use with a reinforced hose, designed and intended for below waterline applications. 3. There is corrosion on the bottom of the water heater, address as needed. Provide and install a discharge hose on the water heater’s pressure relief valve to prevent water from discharging onto the water heater. 4. Provide and install a handle on the waste Y-valve and prove the valve functional. 5. There was a note on the companionway hatch “use left side of cabin sole do not walk on wood, the step is loose, Captain Jack”. There appears to have been new lamination work as visible in the aft saloon cutout. The cause and significance of this work is beyond the scope of this survey. 6. Return the windshield wiper arms and prove the wipers properly functional as desired. 7. Replace the cracked plastic port side forward cockpit window. 8. The radar arch is somewhat flimsy, reinforce/support as necessary. 9. The bimini top is moldy; clean the bimini top as desired. 10. There is impact damage on the port aft corner of the swim platform, repair as desired. 11. The bottom is being prepped for painting, the propellers are removed and the starboard propeller shaft is loose. The trim tabs are disconnected from the rams. Reconnect all components; reassemble prior to launching the vessel.